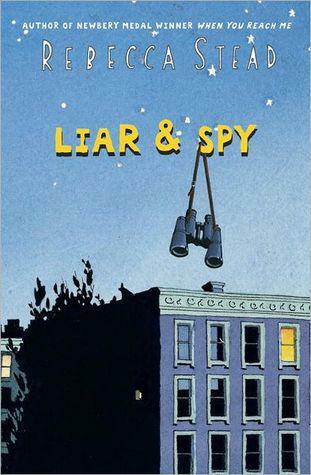 Rebecca Stead is the author of four books, two of which, Liar & Spy and the Newbery Medal winner, When You Reach Me, I have reviewed here. 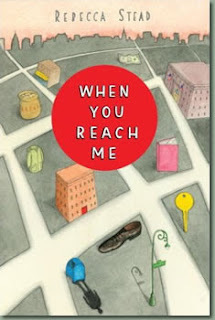 When You Reach Me is a book that will stay with me the rest of my life. I shy away from making Top 5 or Top 10 lists, but I know that every time I see the cover for this book I will feel a thud of emotion and recall what a powerful experience reading that book was. And I know that I will have the same experience in the future after reading Stead's new novel, Goodbye Stranger. Stead is a gifted writer and a masterful storyteller. She reminds me of one of the few novelists for adults I consistently read and always find gratifying, Kate Morton. 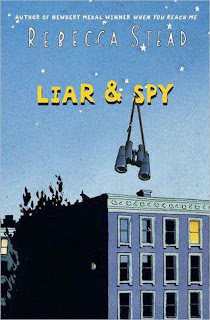 Morton's novels, which are rich with compelling characters, weave stories from the past and present, revealing the connection between the two at the end of the story and always delivering an emotional punch, one that has made me gasp out loud before. While Morton - and Stead's - novels are anything but formulaic, they both employ similar formulas for storytelling that keep me engaged and guessing. Having read so many books, I can often see a plot twist pages in advance (and I am no fun to watch movies with) but I never see coming the surprises and rewards Stead (and Morton) always have in store. Of course, this also makes writing a review a challenge. Goodbye, Stranger divides page time between Bridge, Sherm and an unknown, first person narrator. Bridge and Sherm's stories unfold at the same time, but the unknown narrator's story takes place on Valentine's Day, with Bridge and Sherm's storylines catching up by the end of the novel. Stead has the incredible ability to write a relatively short book that packs an amazing amount of detail and layers into the story. Bridget Barsamian is a seventh grader who is part of a tight trio of friends who have agreed never to fight and never to end their friendship after one of the three experiences the end of her parent's marriage. Bridge is also the survivor of a traumatic accident that took four surgeries and a year of recovery. When she was eight, Bridge was rollerskating with Tab, their mothers walking a few yards behind, and, distracted by a VW Bug and her version of the "Punch Buggy" game, she was hit by a car. Except for a recurring nightmare, Bridge is fully recovered, although something a nurse said to her on the day she was discharged changed the way she thought about herself. The nurse told her that she must have been put on earth for a reason, to survive that kind of accident. Sherm is also in seventh grade. While he is part of Bridge's story, his narrative comes in the form of letters to his grandfather, Nonno Gio. Bridge and Sherm connect when they discover they are both signed up for Tech Crew with Mr. Partridge, who also leads the Banana Splits Book Club for kids of divorced parents. Emily, the third in Bridge's circle of friends, is in the Banana Splits club. She is also a star soccer player and a pretty girl who is hitting puberty harder than her best friends. Then there is Tab, little sister to Celeste and newly radicalized feminist, thanks to her English teacher, Ms. Berman, who prefers to be called "Berperson." Together, the three friends weather the challenges that are part of growing older, growing up and discovering who you are. Stead takes Goodbye, Stranger into the 21st century when she has Em become involved with a popular eighth grade boy who encourages her to text increasingly inappropriate pictures of herself to him. Talking to this boy, Bridge thinks to herself, "Patrick was only one grade above them, but something about him was older, as if he'd crossed a line Bridge couldn't even see yet." 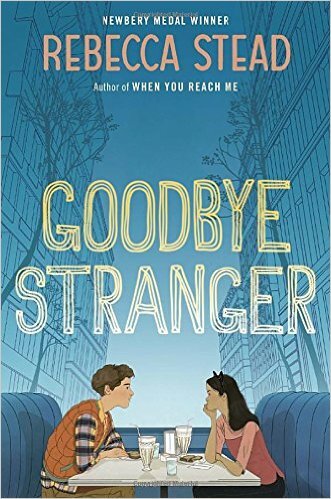 I realize that at this point, I really haven't told you much about Goodbye, Stranger that might lead you to believe it's as amazing as I say it is, and that is in part because of what I can't say about it. But it's also because Stead takes threads of everyday life and weaves them together to make something larger and more meaningful, much like the Georges Seurat painting pointillist painting that was at the center of Liar & Spy. Small details like Hermey, a character from a television show that Bridge and her older brother Jamie quote to each other, Mr. P buying black and white cookies from Nussbaum's for the Banana Splits and a pair of cat ears that become a "comforting presence" add up to something bigger. But it is the emotional complexity of Stead's writing that is most powerful and unforgettable. 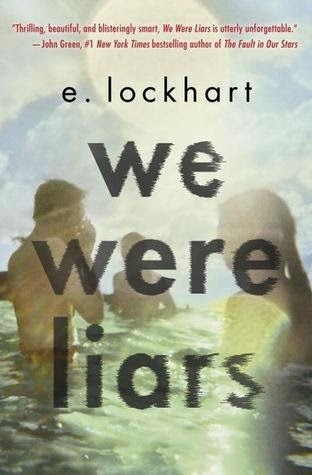 While talking about the most moving storyline in the book would be too much of a reveal, there is another emotionally mighty moment that comes when a character reflects on a betrayal of trust, asking, "Who is the real you? The person who did something awful, or the one who's horrified by the awful thing you did? Is one part of you allowed to forgive the other?" The character does something I think suspect is universal among adolescent girls - sharing a secret you promised to keep. In Goodbye, Stranger, this sharing is done as a way to reconnect with a friend who has begun distancing herself, a friend who has also begun to reveal a deep, wide streak of meanness. Stead describes the momentary, euphoric connection that this sharing brings and also the anguish, with a clarity that brought me vividly back to my own adolescence and my own missteps. In the end, as with all her books, Stead tells a story about connections between people, connections that ultimately are about love and compassion. The connections may be tenuous and strained and characters may find themselves alone and hurt, but they always find their way to each other.